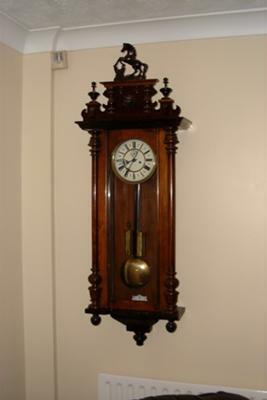 I have a circa 1890 two weight Vienna Regulator. I have had the clock for several years and it has worked okay. Recently it stopped working and I re-set up the clock - however, I am unable to set up a healthy and continous "tick "tock". Upon closer examination it would appear that the weights are now not sufficent to now make the clock tick properly and also the chime mechanism is very laboured. If I apply some downwards hand pressure to the weights I get a healthy "tick" "tock" and the chiming mechanism works as normal. Can this happen over a perid of time? Are there any springs which could have become "weak" or does it point to ther problems with the clock mechanism. I love this clock . Can you give me any adive/help? Hi sound like it needs a good clean & re-oil. Either completely taken to pieces or ultrasonicaly cleaned , the latter being the cheapest method. Like all mechanical items they need to be serviced now & again. It sure sounds to me like it could use a cleaning and oiling. This is exactly the way a clock acts when they are dirty and gummed up.